This is totally candid. It takes my mom such a long time before taking my photo. My mind has gone to the moon and back by the time I hear the first click. But, I must give it to her, she is definitely improving. There are less blurry shots now. Yay! 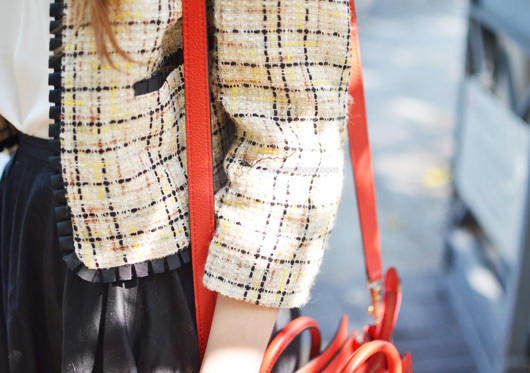 How can you not look wholesome and sweet with a tweed jacket, peter pan collar, ribbon flats and pearls? According to the sales assistant at YSL, he thinks we might be one of the first to get this limited edition YSL Arty ring in his country. He said that only a hundred pieces were ordered and they were just delivered earlier that day. This ring was especially made for Valentine’s day hence the fuchsia color and the word “love” carved on the back of the ring. Valentine’s day really is just around the corner! 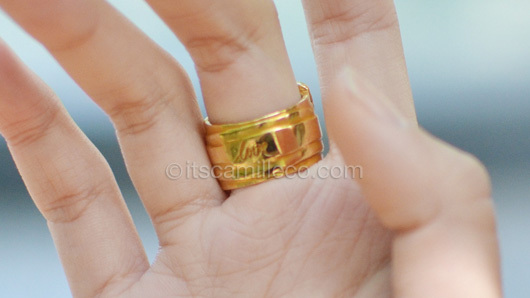 How much is the YSL artsy ring? Love the pop of red right on your feet! And of course your bag! 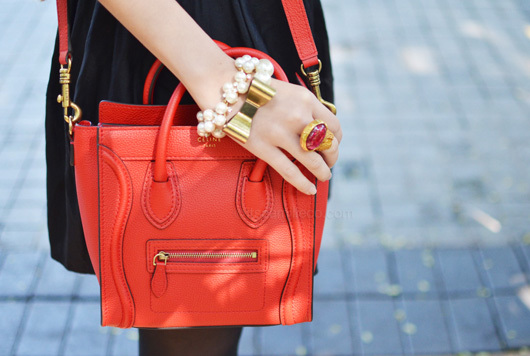 If that Celine was mine, I’ll definitely overuse them! Swerte ng magiging anak mo! She’ll get to inherit all your signature bags! haha! Anyway how do you store your bags especially the leather ones?